This salad is loaded with layers of flavor. 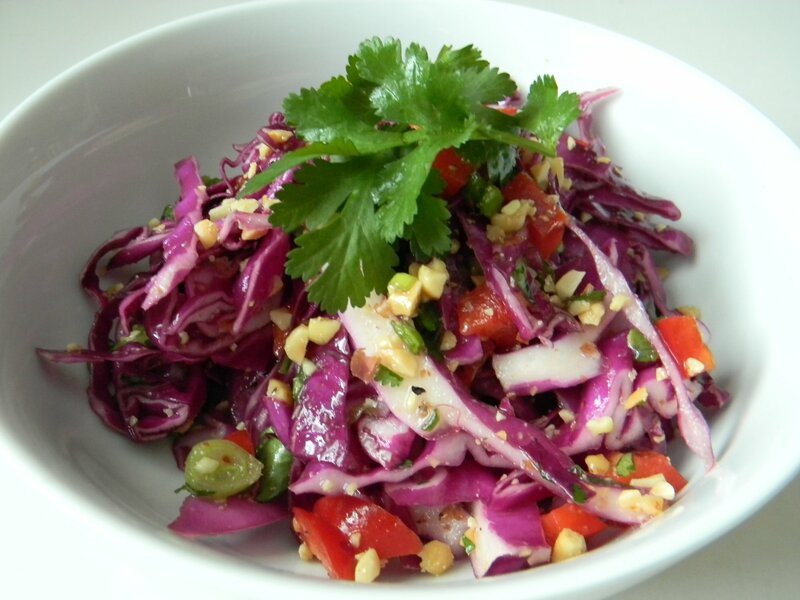 We begin with beautiful, bright, and healthy vegetables and fresh cilantro. 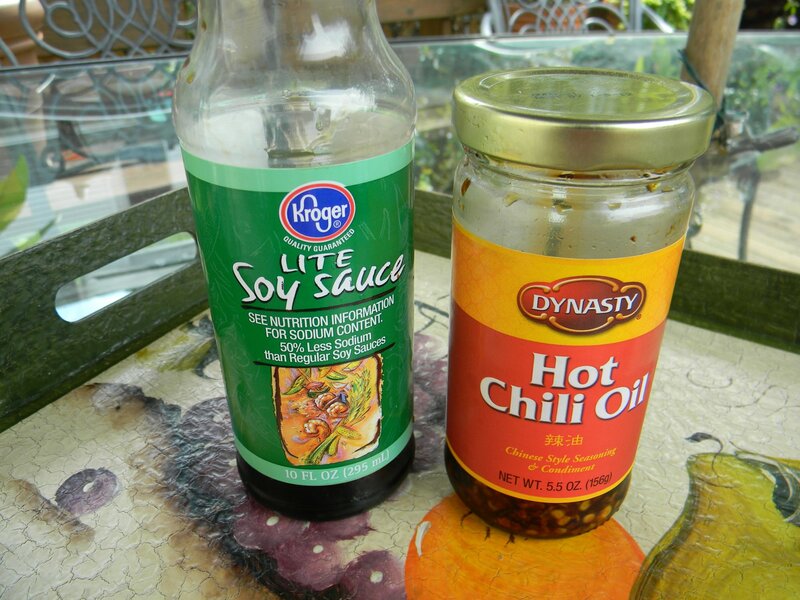 For the dressing, I love sweet and spicy, so I added sugar and a little chili garlic sauce. I then top with chopped salted peanuts. 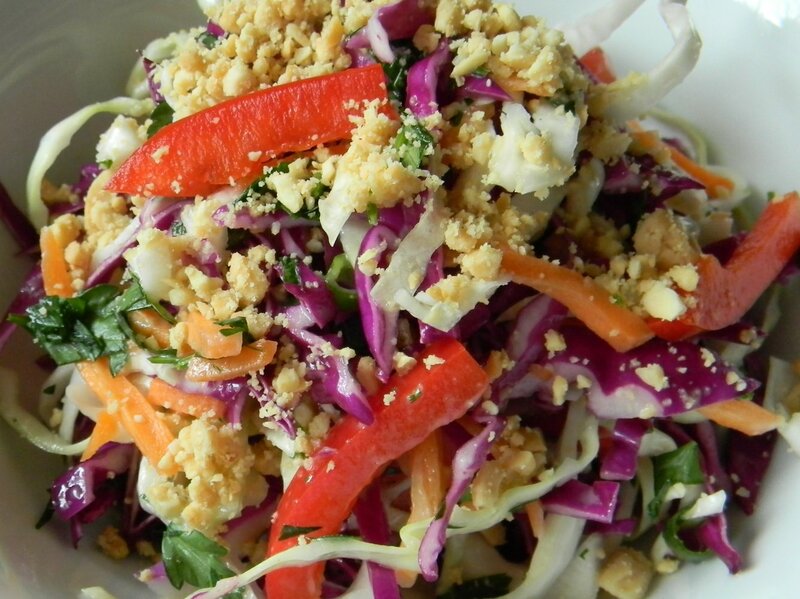 Crunchy vegetables, sweet and spicy dressing, fresh cilantro, and salty peanuts, the perfect combination! Serve with simple grilled chicken breast and steamed rice for the perfect dinner. If you have leftovers, enjoy the next day. 1) Whisk all dressing ingredients together and refrigerate if you’re not using immediately. 2) Into a large salad bowl, add all salad vegetables and ½ of the peanuts. Thirty minutes before serving, add the salad dressing and toss to coat. Just before serving, toss again. Top with peanuts. Serve immediately. Refrigerate leftovers. Makes 6 servings. These taste as good as they look! Oh my gosh, sooooo delicious! It’s the perfect combination of sweet and spicy. There is so much flavor in the sauce that all you need to serve with is is simple steamed rice and stir fry vegetables. Spoon extra sauce over the rice and chicken, YUMMY! Finely chop 1/4 cup fresh ginger…. And 1/2 cup red onion…. Saute in a tablespoon of canola oil in a medium saucepan for about 5 minutes, stir often. ﻿Add four large cloves of minced garlic and cook for about one more minute. Now for liquid ingredients. Add 1/3 cup of honey. If you spray your measuring cup with cooking spray it will come out of your measure more easily. Add 3 tablespoons of mirin. Mirin is a sweet rice wine used for cooking. This and the following ingredients can be found in the Asian isle of most grocery stores. Add 1/4 cup rice vinegar. Next add 1/2 cup of low sodium soy sauce. I know it seems like a lot of ingredients. Trust me, it will be well worth all the measuring. Add three tablespoons of hoisin sauce. I love the flavor of this sauce. It is sweet, salty, and a little spicy. If you haven’t used this sauce before, it is a Chinese dipping sauce and commonly used in Peking Duck. Now for some heat. Add 2 teaspoons (or more if you like) of chili garlic sauce. This amount will not be too hot. Once all the sauce ingredients are in the pan, simmer for about 3 minutes to slightly reduce. Set aside. Prepare the chicken legs. Season generously with salt and pepper, coat with about a tablespoon of canola oil, toss to coat with the oil and seasoning. Add 3 tablespoons of flour, toss to coat. Give prepared chicken legs a drizzle once arranged on a non stick foil lined cookie sheet. “Oven fry” at 400′ for about an hour. For even browning, give them a turn half way through. Once the chicken is crispy, time for he sauce.﻿ Have your serving platter ready to go. Dip each leg into the sauce to coat…..
And sliced green onions. Drizzle with a small amount of honey. 1) Preheat oven to 400’. Non stick foil line a cookie sheet with sides, set aside. Place chicken legs in a large bowl and drizzle with one tablespoon of canola oil. Season generously with salt and pepper. Toss to coat. Sprinkle the flour over the legs and toss to coat. Place on prepared cookie sheet and lightly drizzle with canola oil. Bake for 45 minutes to an hour or until nicely brown and crispy. 2) Place a medium sauce pan over medium heat and add 1 tablespoon canola oil. Once hot add the ginger and red onion. Cook for about 5 minutes, stirring often. 3) Add garlic, cook for about one minute. Add the rest of the sauce ingredients and simmer for about 3 minutes to reduce slightly. 4) Chop the peanuts and slice the green onions. 5) Once the chicken is done, with a tongs dip each chicken leg into sauce to coat. Garnish with the chopped peanuts, green onion, and a light drizzle of honey. Makes 8 servings. *Serve with steamed rice and simple stir fry vegetables. Spoon extra sauce over chicken, rice and veggies, yummy! *Substitute chicken wings for the legs for an flavorful and beautiful appetizer. 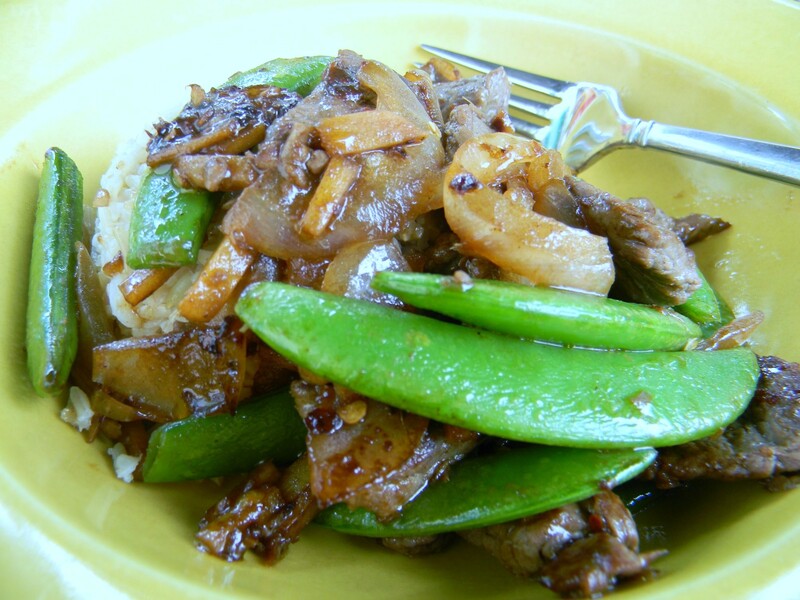 Stir frys are quite simple, healthy, and delicious. I think it best to enjoy the ones you make at home as you can control the amount of oil that is used. Use whatever vegetables you like. Just remember that when you begin cooking to cook the vegetables that take the longest to cook first. This recipe is a delicious combination of sweet and spicy with vegetables that have many different textures, so good! Adjust the level of spice according to your own taste. If you’d like it to “blow your head off,” add jalepenos at the end of step #5. Have everything completely pan ready before you begin to stir fry. Let’s not forget the rice! Before you begin cooking, put the rice on the stove. If using brown rice, count on at least 40 minutes of cooking time. Begin cooking the stir fry after about 20 minutes. If using white rice, rinse the rice thorougly through a fine sieve. (this will prevent the rice from being too gummy or mushy) Cook according to package instructions. Once it’s on the stove, you’re ready to start cooking. I’ve assembled all my ingredients. You can see in the very back a measuring cup with sauce ingredients ready to go. Use a large heavy skillet. It is important not to crowd ingredients in the pan. Plenty of space will allow for nice browning on the chicken. It will also make the stir fry cook very quickly. 1) On a cutting board designated just for meat, cut the chicken breast into small pieces. Season with salt and pepper and toss well with one teaspoon cornstarch to coat. (this will allow the chicken to brown nicely) Refrigerate until you’re ready to cook. 2) Prepare all vegetables and put into separate bowls. 3) Prepare sauce. Mix cooled chicken bouillon with cornstarch, whisk until blended. Add the soy sauce, sugar, sesame oil, and chili sauce, whisk. Set aside. 4) Heat a large heavy non stick skillet or cast iron skillet over medium-high heat until very hot. Add one tablespoon oil and add chicken breast. Cook for 10-15 minutes, or until chicken is nicely brown. Add garlic and cook for one minute. Remove from pan into a large bowl, cover with foil. 5) Add remaining tablespoon of oil. Add the bell peppers, cook for about 3 minutes. Add mushrooms and bok choy. Stir fry for about 5 minutes stirring often. Add snap peas and green onions. (add jalepenos here if you wish) Cook for a couple of minutes. 6) Whisk the sauce ingredients until well blended and add to the pan with the veggies. Bring to a bubble. Add chicken back to the pan. Add basil and mix well. Serve over brown basmati rice and garnish with sesame seeds. Serves 4. Orange & Ginger Glazed Chicken Kabobs…. As you can see, I’m on an Asian kick! Instead of Chinese “take out,” I’m going to call it Chinese “make in.” Be sure to buy a good size chunk of fresh ginger, about two times the size of your thumb. Use a whole fresh orange, the zest of the orange will give a very intense orange flavor. Feel free to add red pepper flakes to the sauce if you like it spicy. For sides, do anything you like. I love brown jasmine rice and simple stir fry vegetables. Would also be great with Thai peanut noodles..yum! 2) Wash and dry the orange. Zest the orange and set zest aside. Juice the orange into a 1 cup measure. Add enough additional orange juice to measure 1 cup. Pour into a small sauce pan, add ginger slices, and reduce over medium heat to ½ cup. Add honey and continue to simmer over medium heat for 5 minutes. Remove from heat and remove ginger slices. Add toasted sesame oil and orange zest. Allow to cool. 3) Preheat grill. Cook kabobs over medium high heat for 10-12 minutes. Generously brush glaze over chicken. Watch closely, the sugars will burn if you’re not careful. Place on serving platter, brush with additional glaze. Garnish with sesame seeds, green onions, and orange slices. Serve with steamed or vegetable fried brown rice and simple stir fried snap peas. Serve additional glaze on the side. Beef & Vegetable Stir Fry…. I add a bit of spice to this dish, but it’s optional. Make it to your taste, add a bit more spice if you dare! If I were making this for myself, I would add fresh thin slices of jalapeno peppers, seeds included! 1) Place the strips of beef, cornstarch, rice vinegar, and soy sauce in a small bowl, combine and refrigerate while you are prepping the rest of the ingredients. 2) Prepare garlic and ginger, and place into their own small bowls, set aside. 3) Prep carrots through broccoli. I use a small bowl for each and place them on the counter in the order they will go into the pan. 4) In a 2 cup liquid measuring cup, add water or broth, soy sauce and cornstarch, whisk. Add chili hot sauce, hoisin sauce, honey, and sesame oil. Whisk until blended. Set aside. 5) We’re ready to go! Heat your wok or pan over high heat. Add 2 teaspoons of oil to pan. Add ginger, cook for about one minute. Add beef and cook about 3 minutes, stirring often. Add garlic, cook about one minute. Place into a large bowl, wipe out pan with paper towel. Put the pan back on the heat. Add 1-2 teaspoons of oil and begin the veggies. Add the carrots and onions, cook 3-4 minutes, stirring often, the sugars in the carrots and onions will burn if you’re not careful. Add mushrooms and red pepper. Cook 2-3 minutes. Add broccoli. Continue cooking for 3-4 minutes. 6) Place all veggies into the bowl with the meat, loosely cover. 7) Give the sauce another whisk and add all at once to the pan, stir constantly, it will thicken quickly. Add all stir fry ingredients back to the pan and heat through. Serve over steamed brown or white rice. Or serve with brown fried vegetable rice. Enjoy! 1) Heat a large non stick skillet over high heat. Add oil. Add eggs, all at once, stir constantly and break into small pieces. Add rice and green onions. Drizzle soy sauce and sesame oil over rice. Heat through, stirring often to prevent scorching. Add mixed vegetables and bean sprouts. Taste. Season with more soy sauce if necessary. Top with sesame seeds. Remember, be creative, add whatever vegetables you like! To make this a quick dinner entree, add some leftover pieces of rotisserie chicken or thinly sliced leftover grilled steak or pork! Simply stir fry in the pan at the very beginning, remove from pan before adding eggs, then add back to pan after adding the rice.